For all COMSOL Multiphysics® users, version 5.3 brings some of the Application Builder functionality and benefits to the Model Builder with model methods, making it possible to automate any type of modeling task. 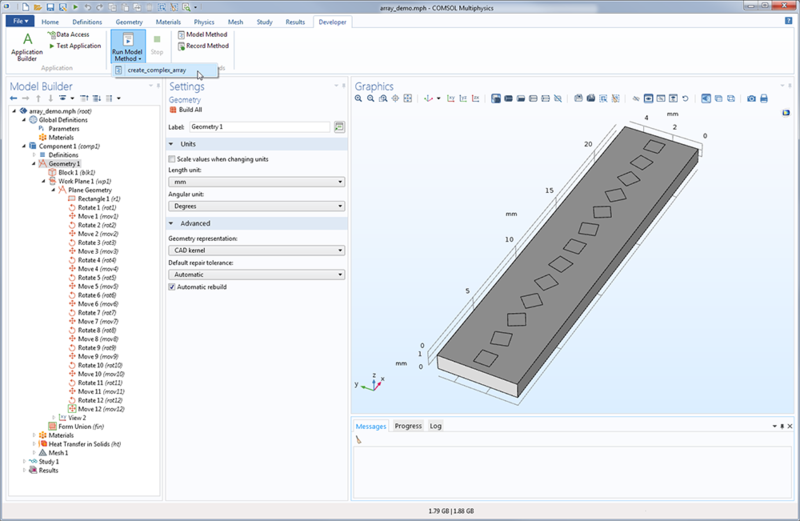 Learn more about this and other updates to the COMSOL Desktop® below. Several performance optimizations have been implemented that mainly impact larger models containing either a large number of features or a large number of geometric entities. Loading such models is now many times faster, where working with selections, for instance in the Selection List window, can be up to 15 times faster. Switching between nodes in the Model Builder tree is also much faster. See more details on the Major News page of the Release Highlights. Methods enable you to perform complex operations in specialized applications using the Application Builder and its Method Editor. This capability has now also been added to the Model Builder with the new Model Method functionality, which can be accessed through a new tab in the ribbon — the Developer tab. Using model methods, you can perform complex operations directly on the model you are working with, such as setting up geometry sequences from data in a text file, changing solver settings based on specific criteria, or creating template plot groups. Selecting the Model Method functionality from the Developer tab opens the possibility to create and edit methods within the Application Builder's Method Editor. Here, you have access to functionality that helps you write method code, such as code completion using the Ctrl+Space keys and the Record Code functionality. You can also use breakpoints to debug your methods. Running your methods from the Developer tab will directly update your model in the Model Builder. Since model methods require the Application Builder, they can only be created in the Windows® operating system, although they can subsequently be run on any platform. The new Developer tab in the ribbon from which you can create, record, and run model methods. 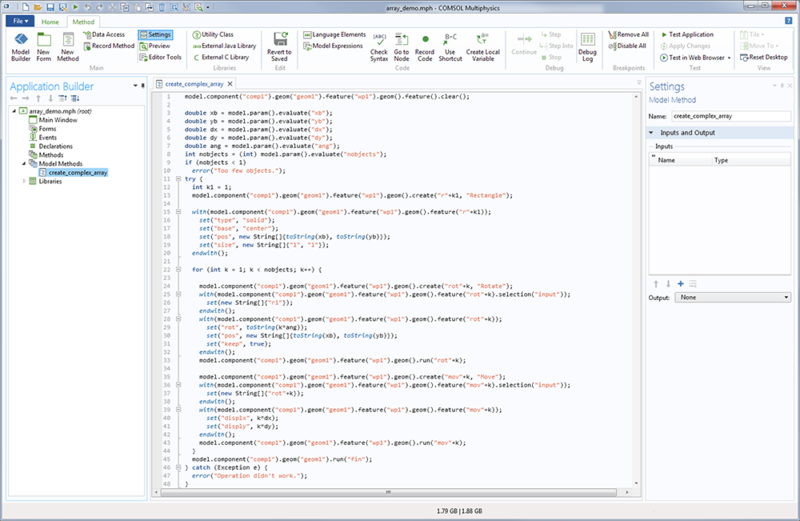 Model methods are created and edited within the Application Builder's Method Editor. In the example method here, it sets up a geometry sequence and when it is run, changes to the model take effect immediately. Although you cannot create or edit model methods in the Linux® or macOS versions of COMSOL Multiphysics®, you can run existing model methods. 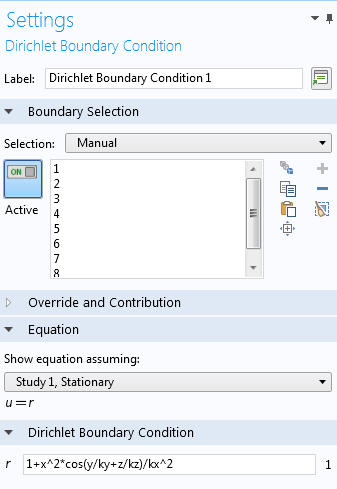 Model methods are available from the toolbar menu. Example of accessing and running a model method from a macOS toolbar menu. Preferences are now automatically copied from previous installations of the COMSOL Multiphysics® software, so that you can retain your custom settings in new installations. This includes settings in the Preferences dialog box as well as user-defined material libraries. When you enabled the Click and Hide feature in previous versions of the Graphics toolbar, you needed to remember to disable it again once you had finished using its functionality. Otherwise, you would still be in Hide mode when continuing with your modeling, such as when creating a new feature. Any mouse clicks in the Graphics window would then still hide geometric entities rather than add them to the new selection. 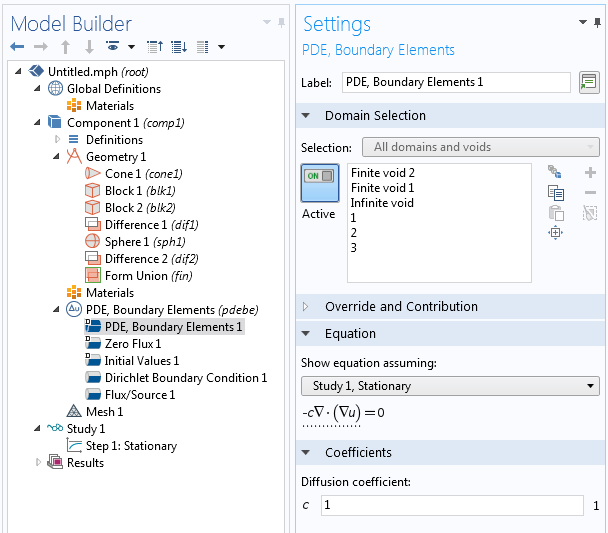 In COMSOL Multiphysics® version 5.3, you now automatically exit the Hide mode when you begin a different operation, such as selecting a different node in the Model Builder tree. Click and Hide in the Graphics window toolbar. Two new toggle buttons make it easier to work with the Selection List window: Only List Selected and Only List Visible. The former filters the selection list such that it only shows entities that are selected, whereas the latter filters it to only show entities that are visible. Furthermore, selected entities are indicated with the text string "(selected)" after the identifier. This is in addition to how hidden entities were already indicated with the text "(hidden)" after the identifier in previous versions of the software. This image shows the Selection List window with the new "(selected)" label. This image shows the same scenario as the left with the Only List Selected feature enabled, such that only the selected items are displayed. In COMSOL Multiphysics® version 5.3, it is no longer possible to open models saved in version 3.5a. Models saved in COMSOL Multiphysics® version 4.0 and newer are supported. The binary storage of solution data has been developed so that storing dynamic solution data is done differently during the modeling process and in the MPH-file. Working under the hood, this change makes it faster to load and save MPH-files. Now, limited amounts of solution data are read when MPH-files are opened, while dynamic data is only read upon request. When saving MPH-files, the dynamic data has already been written to files, so that it can instead be copied to the relevant MPH-file from the Recovery or Temporary Files folders. You now have much better control over the display of physics symbols on geometries visualized in the Graphics window. These can be switched on or off, both within the respective physics interface Settings window and the settings for individual features under a physics node. Switching between showing and not showing physics symbols in your model setup in the Graphics window. You can select Enable physics symbols in the main node's (e.g., Solid Mechanics) Settings window (top) as well as in a single feature's (e.g., Point Load) Settings window (bottom). COMSOL Multiphysics® version 5.3 provides two new physics interfaces and one new mathematical interface based on the boundary element method (BEM). The AC/DC Module contains the new Electrostatics, Boundary Elements interface, while the Corrosion Module and the Electrodeposition Module contain the new Current Distribution, Boundary Elements interface. 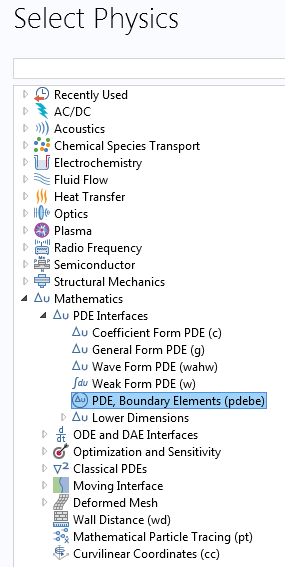 In the COMSOL Multiphysics® core package, the Mathematics branch has been extended with the new PDE, Boundary Elements interface in 2D and 3D. This new interface is used to solve Laplace's equation in both finite and infinite modeling regions. Physics interfaces based on BEM differ from those based on FEM in that they only use mesh elements on the boundaries of the modeled regions (curves in 2D and surfaces in 3D). Physics interfaces that use BEM are applicable to modeling three types of volumetric regions: domains, finite voids, and infinite voids. Finite and infinite voids are not volumetrically meshed and the mesh generator will only generate boundary elements adjacent to such regions. Yet, BEM can also be used to model domains containing volumetric meshes, although it only uses the boundary elements of such domains. On the other hand, physics interfaces that use FEM are only applicable for modeling domains and not finite or infinite voids. Unlike physics interfaces based on FEM, which produce sparse system matrices as part of the solving process, the BEM-based physics interfaces lead to filled or dense matrices. This means that even though using BEM requires fewer degrees of freedom to model a domain as compared to using FEM for modeling the same domain and physics, memory requirements when using BEM will grow faster than FEM with increasing geometric complexity and number of elements. This is managed by using iterative solvers in combination with far-field approximations, which avoids explicitly constructing large matrices. The default for physics interfaces that use BEM is to use appropriate iterative solvers in combination with far-field approximations. However, the option for using a direct solver and no far-field approximations can also be selected in these interfaces. The COMSOL Multiphysics® software also supports cases for using physics interfaces based on both BEM and FEM to model the same region or domain containing a volumetric mesh. Forming a hybrid formulation, such combinations are useful when part of the model may include complicated material properties involving nonlinearities, anisotropy, or spatial variations, which can only be modeled using an FEM formulation. This is because physics interfaces based on BEM require material properties to be isotropic and constant within each domain, finite void, or infinite void, while the material properties cannot be nonlinear. Modeling of the electrostatics properties of an oil rig in seawater using the boundary element method (BEM). The size, number of parts, and general complexity of the geometry, along with the unbounded region that the rig exists in, makes an example like this optimal for modeling with BEM. 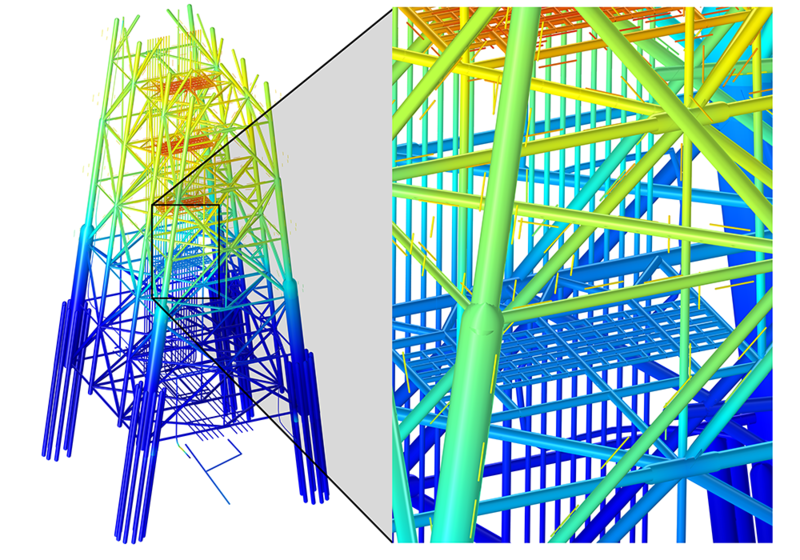 The overlay is a zoomed-in section of the oil rig that shows the finer details such as the sacrificial anodes, which are the thin rods next to the massive rig structure.